No matter what fitness goal or method of exercise an individual chooses- maximum effort and intensity, along with proper instruction and finding joy in what you challenge yourself with, are the key factors in achieving your desired results. Ian attended and played football at Kansas State University. 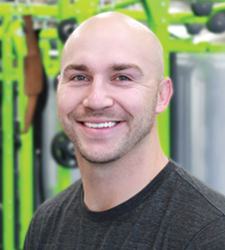 He is both a Personal and Small Group Trainer and he specializes in weight training for fat loss. In Ian’s spare time he hangs out with his wife and pups, and if you are lucky he might just make you a plate of his biscuits and gravy.